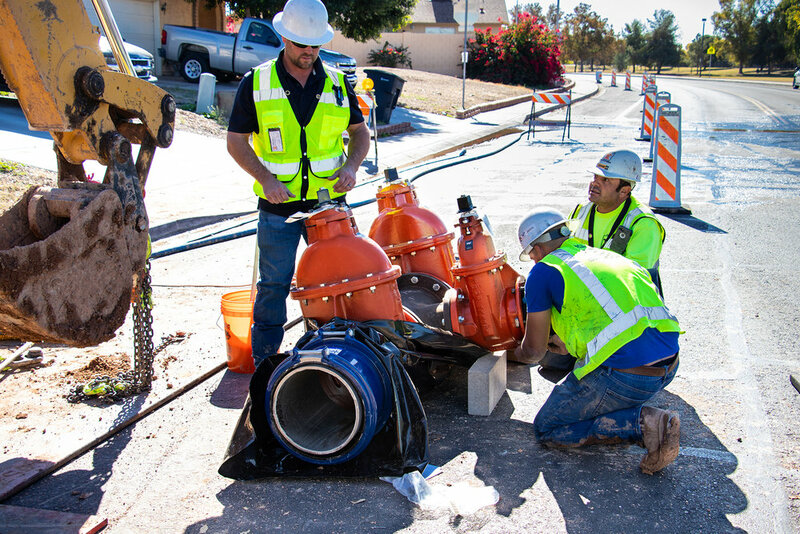 This job order contract involves water main and valve installation and replacement as well as emergency repairs. The scope of work includes general construction services (and engineering services as necessary) on major and minor projects that encompass new construction, reconstruction/renovation, repair, rehabilitation, addition, demolition, and other alterations to City infrastructure. Job Order #1: Achen-Gardner Construction cut and plugged an 8” water line located within the Chandler Municipal Airport. Job Order #2: The scope of this job order initially involved performing emergency clean-up and channeling of water flowing from a break in a 36” water line. 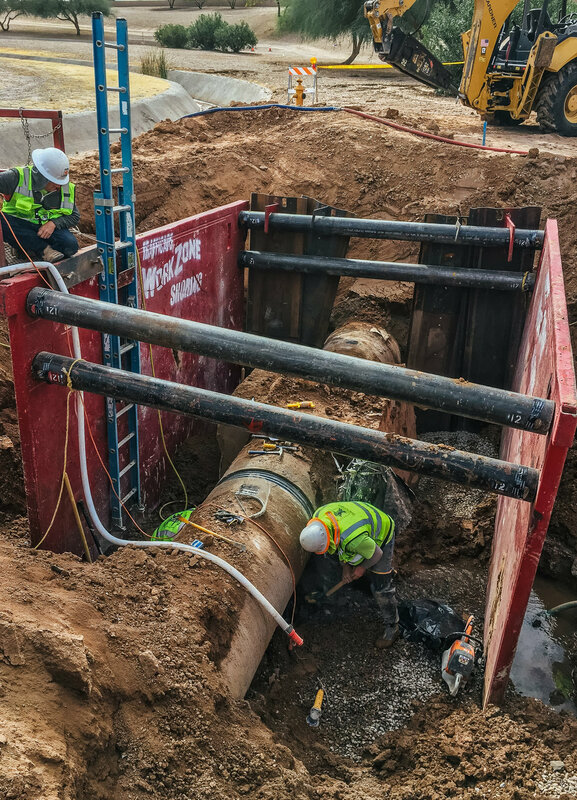 Additionally, we provided investigative and assessment services to identify the exact location of the break, condition of the pipe and special fittings, and performed repairs. 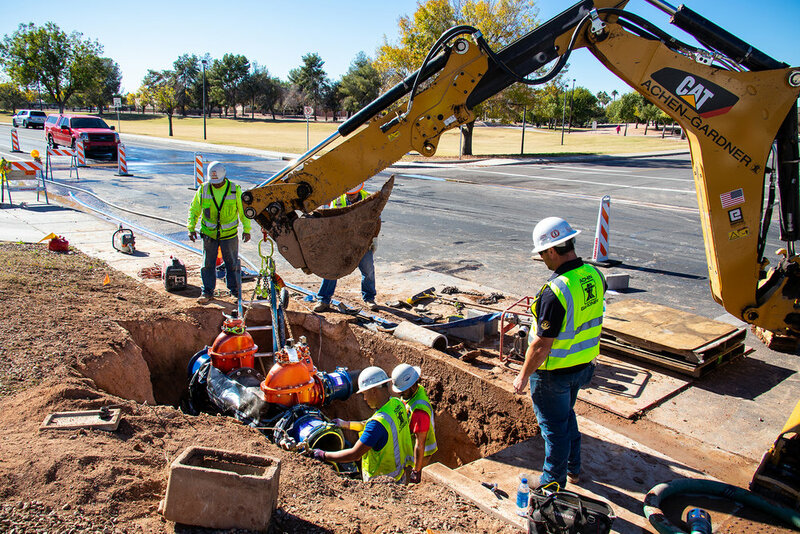 The initial break assessment resulted in additional findings that the original pipe installation did not meet specifications and standards, so additional joint and pipe assessment was performed on the existing 36” and 30” water lines installed under the Loop 101 and Loop 202 freeways and at three access locations. The following pipe assessment of 2,500 LF of 30” pipe, 36” pipe and repair services were provided: interior pipe video, joint seal/repairs, pipe segment replacements, fabrication and installation of manways and new valves, fabrication of special fittings and field welding of components/pipe, and confined space access and monitoring. 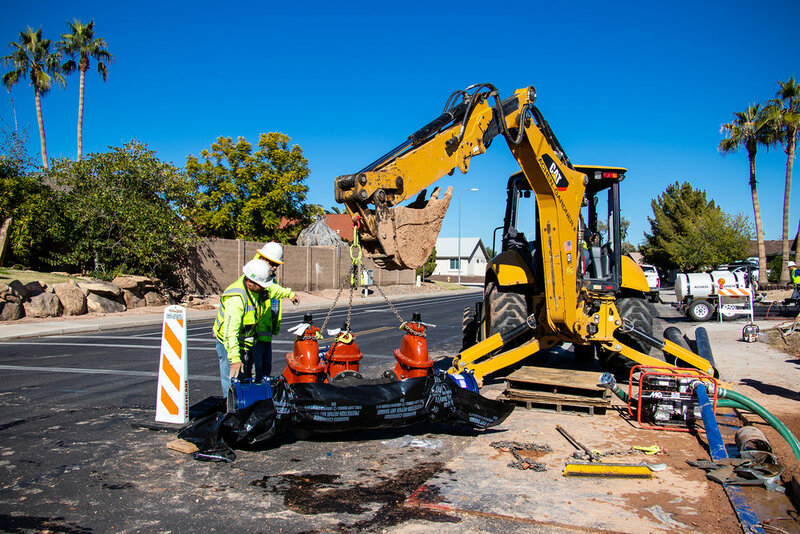 Final scope also included the fabrication and installation of one 36” valve and tee with manway and 60” manhole, and two 30” valves and tees with manways and 60” manholes. Job Order #3: Achen-Gardner Construction replaced 27 valves (12” to 6”) in various locations identified by the City. As part of the scope of work, we coordinated with City staff to define water shutdown plans, identified the stakeholder boundaries of the shutdowns and provided a stakeholder coordination/notification plan and schedule, and performed valve replacements and restoration of the affected areas.